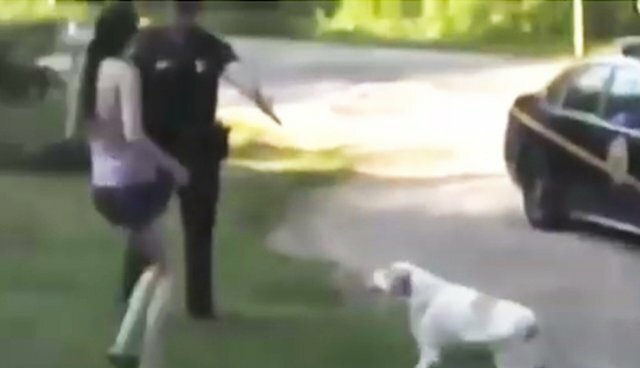 A troubling video has emerged showing the shocking moment a uniformed officer threw a woman to the ground as she tried to prevent him from shooting a dog. The footage, obtained by the website TheFreeThoughtProject.com, reports to show a West Virginia state trooper aiming his pistol at the mid-sized dog, who does not seem to be an immediate threat. The tethered animal appears to be merely standing in front of him, wagging her tail. Moments later, a woman is heard shouting, "You can't do that," before stepping into the line of fire. The officer then grabs her by the arm and throws her to the ground. Interestingly, the officer does not reengage the dog who he'd been poised to use lethal force against. The incident reportedly began when troopers were called to the scene where two neighbors were having a nonviolent dispute. Things were going fine and my son decided to film for posterity sake in case anything should happen. There were two dogs present in the area at the time of the video, a black dog which was the neighbors dog that was running loose...and [my neighbor's] dog, which was chained up. When Hupp's daughter saw the officer draw his weapon, she stepped in. For her efforts in preventing the officer from shooting the dog, she was reportedly hit with misdemeanor "obstruction" charges. Response online to the footage above has been condemning the officer's actions, though it's unclear if he breached the law. The Dodo contacted the West Virginia State Police, but the sergeant privy to the case was not immediately available for comment. Police shootings of family pets are more widespread than people might think. According to some animal welfare activists, dogs are killed by law enforcement at a rate of one every 98 minutes, despite nonlethal options being on hand.